Dieting requires self-discipline. When you’re revamping your dietary habits, it’s essential that you make meal and snack selections that do not generate feelings of deprivation. When you feel deprived, you are more likely to cheat on your diet or possibly even abandon it altogether. Before you remove some of your favorite snacks from your diet, do some research to see exactly how they might affect your diet. Many people have the misconception that they can not eat nuts if they are on a weight-loss diet. Research and statistics show that nuts can be a beneficial snack for someone who is trying to lose weight. One of the best ways to make nuts work for you when you’re dieting is to eat a handful of nuts before a meal. Doing so, will make you feel full thereby increasing your ability to exercise restraint when eating the main meal. The challenge of finding sugar free snacks can be conquered when you find a convenient source for sugar free products at good prices. Sugar free chocolate covered nuts are decadent sugar free snacks that offer multiple benefits. When you’re on a weight-loss diet and craving a fun, delightful, mood-lifting snack, sugar free gummy treats are a fantastic choice. 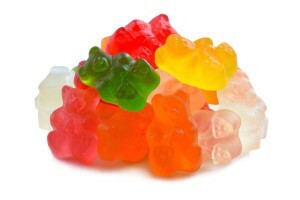 Gummy candy is a favorite among kids, but there’s no reason adults can’t also enjoy them. A glass jar filled with gummy bears or butterflies would brighten up your desk or kitchen counter. Keeping sugar free treats in an easily accessible location can prevent you from going in search of a diet-busting snack. When you find an online sugar free candy store, you can avoid the temptations that arise when you physically walk into a candy store. An online sugar free candy store that offers you some of the best sugar free candy can have a positive impact of your diet. One challenge diabetics face is finding sugar free snacks to buy. When diabetics are able to find sugar free healthy snacks, they get a double bonus. Sugar free chocolate covered nuts are an ideal example of sugar free healthy snacks that can have a positive impact on a diabetics overall health. Individual types of nuts such as almonds, cashews, peanuts and pecans offer different types of benefits for diabetics. In general, nuts such as almonds and cashews help control blood sugar levels. Peanuts have a low glycemic index. Sugar free chocolate covered peanuts are just one example of a delicious, healthy snack that diabetics can enjoy. Almonds are revered for the many nutritional benefits they have to offer. They are packed with vitamins, especially vitamin E and they are a good source of many minerals your body needs. Research shows that almonds can reduce the rise in blood sugar after a meal. Sugar-free chocolate covered almonds would be a tasty way to end a meal. If you’re looking for sugar free fruit snacks, sugar free chocolate covered raisins would be a delicious choice. When your taste buds want enlivening sugar free fruit snacks, gummy treats can provide the tasty excitement you’re craving. Sugar free foods don’t have to be boring. When you find an online source that offers healthy, delicious snack options that you can purchase in quantities that fit your budget and your eating habits, you’re less likely to find yourself experiencing those feelings of deprivation that can cause you to veer off in the wrong direction when you’re dieting or when your specific health situation requires you to carefully monitor the amount of sugar in your diet. You can make your own snack packs or buy a something such as a sugar free chocolate bridge mix to enjoy as a snack or desert. Creativity with cooking and snacking is a key factor in keeping a weight-loss or health-related diet from becoming mundane.